The Upper Great Highway in San Francisco is one of my favorite roads to drive on. There's never any traffic jams, never too many cars going bumper to bumper (unlike 19th Avenue and Sunset Boulevard) and the signals are always synchronized so you can drive a smooth 32 MPH without stopping. The city also placed signage on southbound Great Highway to tell drivers it is OK to drive southbound, but drivers will be unable to turn left on Fulton and Sloat due to the marathon routes. Well... here's the problem. 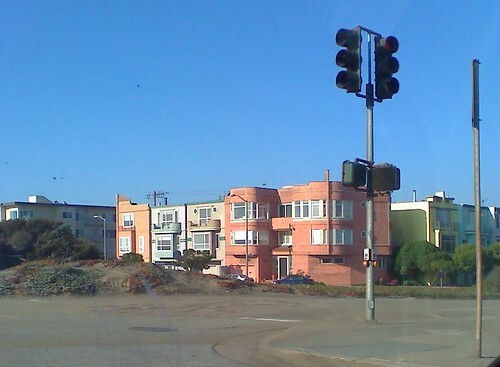 The city says no left turn on Sloat from Upper Great Highway during the marathon, but for the past few weeks, all drivers going south on Great Highway are FORCED to TURN LEFT onto Sloat because of the massive shoreline erosion happening on Great Highway between Sloat and Skyline. That doesn't make any real sense. So I can drive southbound on Upper Great Highway during the marathon, but I can't turn left on Sloat, nor can I continue driving south towards Skyline due to the road closure? Our city government officials are a total bunch of idiots for forgetting the beach erosion road closure. If the city was to really not allow people to make left turns onto Sloat, the city would then have to close southbound Great Highway all the way from Fulton to Sloat during the marathon, making the road literally useless. I asked 311 on Twitter, and they are not the smartest bunch of city employees who can provide answers. Take a look at the conversation: My initial question, their response, my feedback, and their lazy response. In response to their total stupidity and basically telling me to f-off, they gave me the number to the Taraval police station. I gave them a ring and the officer on the phone was really a cool guy. I explained to him the entire situation and he totally understood that the signage is totally wrong. He asked his fellow officers if they knew about this and who installed the signs; he told me it was not them. He told me to call the DPW. Screw it, I'm not making any more phone calls or tweets. F.U. DPW and SFMTA. Use your pea brains once in a while. At least the city's intellectuals (like myself) and the police are smart enough to understand when something stupid is happening.